The crew over at Retro Thing have unearthed an example of the apex of affordable '70s remote control car technology. 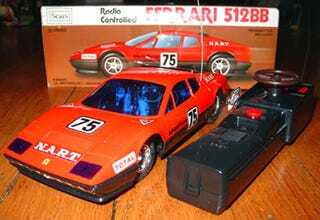 Improving on the miracle of Zenith Space Command, the Ferrari brought the then super expensive world of radio control magic into the hands of regular kids across the country. Battery retailers rejoiced. We had the Corvette version of Sears radio control technology that came before this breakthrough Ferrari. With a press of a button on the radio controller the yellow Corvette turned - in one direction. Monodirectional steering made the Corvette three times as lame as this Italian beauty.